Fox, widescreen 1.85:1, languages: English DD 5.1 [CC] & Dolby Surround, French Dolby Surround, subtitles: English, Spanish, single side-single layer, 23 chapters, theatrical trailer, rated PG-13, 104 min., $29.98, street date 3/2/99. Directed by Mick Jackson. Starring Tommy Lee Jones, Anne Heche, Gaby Hoffmann, Don Cheadle, Jacqueline Kim. Los Angeles. It is perhaps best known as the entertainment capital of the world a sun kissed golden metropolis of glitz and glamour. To others it represents something very different. Like many of this country's urban centers, L.A. continues to fight pollution, battle crime and seek harmony in ethnic, social and financial inequities. And millions more recognize The City of Angels as the unwilling epicenter of virtually every natural disaster -- including earthquakes, firestorms and mudslides. Now the city which has become almost a byword for disaster is about to experience its most cataclysmic event ever, one that will ultimately test its ability to survive. A vent in the earth's crust has unleashed an incredible force of nature. The literally earth-shattering product: an erupting VOLCANO ... and ground zero is L.A.'s famed La Brea Tar Pits. An unprepared Los Angeles is facing its worst nightmare as an endless stream of fiery, deadly lava insidiously creeps across traffic-choked streets while wreaking havoc below ground in the labyrinth of man-made and natural tunnels. I must be getting old. I mean, I can remember back when movies had apparently superfluous components like plots and characters. Nowadays it's just action, action, action! Oy! 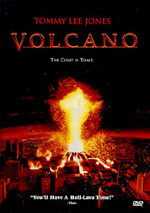 1997's Volcano truly exemplifies the fairly recent trend in movies to completely jettison any semblance of story or characterization in favor of action. At the start of the film, we're given an extremely cursory introduction to each of the many different folks we'll follow throughout the movie. Basically, we learn their names (which I quickly forgot, since that knowledge wasn't very necessary) and their jobs; then the fur starts to fly! Like most disaster films, Volcano boasts only a couple of main characters but features a boatload of supporting roles. There's very little differentiation between the information we get about these two types of characters. The main roles feature Tommy Lee Jones, who works at the Los Angeles Office of Emergency Stuff and who apparently feels a deep sense of responsibility to do his job; he's a real micromanager sort. We also get Gaby Hoffman as his pubescent daughter; she seeks independence but nonetheless - BIG PLOT POINT! - tends to freeze under pressure. Finally, we have Anne Heche as this geological chick who first spots the danger from the volcano and offers helpful hints along the way. Gratuitously, Jones and Heche develop an understated love interest along the way. I could give you these characters' names, but frankly, I can't remember, and there's really no point in checking; it's all completely irrelevant. Since the filmmakers were not willing to actually bother to flesh out characters about whom we could possibly care, some shorthand measures were used to provoke an emotional response from the audience. In a good movie, feelings of sadness or loss are inspired by gradually developing characters who mean something to the audience; that way, when something happens to them, we're genuinely moved. Look at E.T. for example: he was just a damned PUPPET, but there wasn't a dry eye in the house when we thought he died. Why? Because the character was handled realistically (well, as realistically as one can depict a space monkey) and because his relationships with the audience and the cast were developed in such a way that we really grew to care for him. That doesn't happen in Volcano. Since there ARE no actual characters, and even if there were, this film lacks the guts to injure any of the main ones, a cynical kind of emotional shorthand comes into play. A few times during the movie, secondary characters die tragic yet noble deaths, all while dramatic music plays. I found this whole experience manipulative to the extreme. Some of these characters go through terrible trauma just to elicit a cheap emotional thrill. For example, one dude tries to rescue a guy from a subway car that's rapidly becoming lavafied; after he jumps out of the back of the train, he gets Wicked Witched while he heroically tosses the injured guy to safety. Clearly the filmmakers felt they needed to insert some "serious drama" into the piece, but it's all just cheap and sleazy emotional manipulation. Bizarrely, Volcano also attempts a cheesy "we're all brothers" racial understanding theme. A gratuitous segment in which a vaguely racist white cop harasses a black guy who wants help for his neighborhood involves this theme. It ends happily, of course. Just in case we missed the point, the film ends with a wee lad surveying a crowd of adults who are covered in ash - "Look at their faces!" he squeals. "They all look the same!" Now THAT'S real subtle. Hey, I have nothing against the promotion of racial harmony, but I fail to see the point of this bit. It all seems like still more quick and dirty emotional manipulation. One last comment about the manipulative nature of this film: as noted earlier, Jones' daughter Hoffman apparently panics in dangerous situations and freezes. Why? So we can see Jones rescue her! This happens twice in the film. It's a pretty pathetic way to involve Our Hero in the action. It's not quite as bad as the tragic deaths, but it comes across as a ridiculously transparent plot device. In addition to our unbelievably sketchy and undeveloped characters, we receive not even the vaguest semblance of a plot. Essentially, a volcano has appeared in L.A., and Jones has to stop it. Now, I'm no geologist or volcanologist (I'm a loveologist, baby! ), but I doubt that there really IS any way to stop a volcano, much less through the pretty absurd measures on view here. Well, at least it gives the characters something today, and their actions actually seem less contrived than the ridiculous ways Our Heroes were kept in harm's way during Dante's Peak. Ah, yes - Dante's Peak, the other volcano movie from early 1997. As with last year's Armageddon vs. Deep Impact Battle of the Plummeting Space Debris, those two inspired many long, vicious worldwide "which one's better" battles among internet geeks. Dante's Peak clearly wins out as far as realism goes, but I definitely give Volcano the nod because it's damned exciting. At the end of the day, that's really what matters. God help me, but I enjoyed Volcano. I could spend all day picking it apart; it's one of the flimsiest houses of cinematic cards I've seen. The entire film is patently absurd. Still, even WITHOUT considerable suspension of disbelief, it does what it needs to do: it provides a tremendous amount of terrific thrills. The main problem I had with Dante's Peak revolved around the fact that it was simply DULL. If I want to see a movie infused with realism, I'll watch Elizabeth. When I want to see stuff blow up, I'll watch Volcano. Who cares if it's true to life? It's exciting, damn it! Dante's Peak definitely boasted better special effects, however. Actually, Volcano looks okay for the most part; the effects generally work pretty well. One extremely notable exception involves the ever-important lava itself. This film shows veritable rivers of the computer animated stuff, and it looks terrible. The movie's realism hits an absolute nadir when we have to watch that crap flow past us. I've seen grade school science experiments that better simulated lava. One other regard in which Dante's Peak beats Volcano is their respective DVD editions. Universal gave Dante's Peak their special edition treatment. It boasted an amazingly crisp picture, fine sound, and a raft of supplemental materials. In comparison, Volcano can't compete with that package. The picture quality is generally good, though it occasionally seems strangely flat and periodically offers a fairly soft focus. It handles the many low lights scenes well, however, and colors appear solid. The only area in which Volcano bests Dante's Peak involves its Dolby Digital 5.1 mix. While the latter's soundtrack gave my system a workout, it was nothing compared the sonic bombast found during Volcano. That film offers very active split surround effects and creates an immersive sound environment. It wasn't quite up to "A+" material such as Twister, but it came close. Volcano doesn't even remotely compete with Dante's Peak in the area of supplemental materials. The latter included an audio commentary, a documentary, and a few other features (be sure to read my review for more info!) but Volcano simply gives us a theatrical trailer and some rudimentary cast and crew bios. Amazingly, Dante's Peak lists for only $5 more than Volcano but it provides a much greater value. That said, if I had to pick just one, I'd go with Volcano. I love the care with which Universal put together the terrific Dante's Peak DVD, but at the end of the day, the movie's the important thing. Personally, I greatly prefer Volcano. It offers a much greater sense of thrills and excitement than does the much more sedate Dante's Peak. While Fox does nothing to boost interest in Volcano with its DVD release, nor does this version harm the film. It offers a solid rendering of an incredibly flawed guilty pleasure.